Oklahoma: This past week I spent in fields/nurseries around Stillwater and also attended field days in central OK (Caddo Cnty) and southwestern OK (Jackson Cnty). Most of the wheat I saw was at ¼ to nearly full berry. Foliar diseases have definitely increased. Around Stillwater, powdery mildew is evident on the lower leaves in my fungicide trial (approx. 25% severity). In the variety demo strips at Stillwater, I can find severities >65% on lower leaves. However, stripe rust is still the most evident foliar disease with mid-canopy leaves of susceptible varieties often completely or nearly completely infected. Flag leaves of susceptible varieties around Stillwater are beginning to show stripe rust pustules, but that is still not uniform in all fields/locations. Also this past week I started to see leaf rust pustules developing on lower leaves; I only occasionally saw pustules on flag leaves with the exception of ‘Jagalene’, which was at 90% or so. In central OK I saw mostly the same thing. At the variety trial near Kingfisher (Kingfisher Cnty), disease was surprisingly light with stripe rust the most evident. Near Apache OK (southern Caddo Cnty), disease was more prevalent with stripe rust the most severe. Varieties resistant to stripe rust but susceptible to leaf rust (e.g., ‘Jackpot’ were beginning to show more leaf rust pustules). Tan spot also was evident at this variety trial as it is a no-till field. 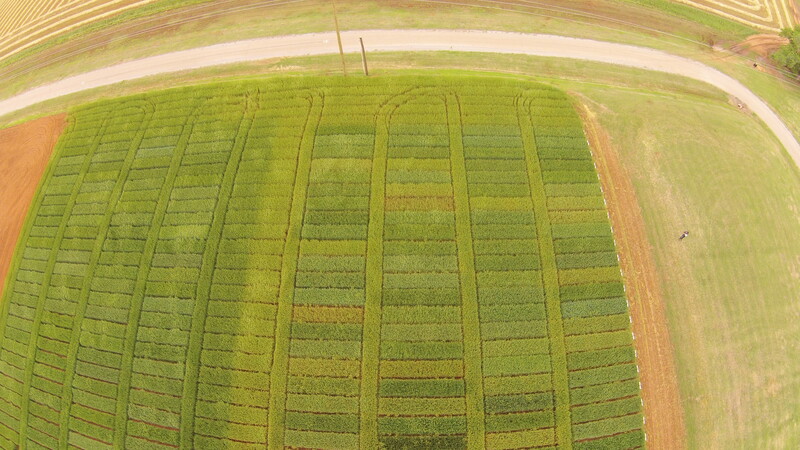 This overhead shot of the Chickasha intensive and standard wheat variety trials illustrates the severity of stripe rust in the region. The intensively managed trials on the left was treated with a fungicide just prior to heading. The standard trial on the right has the exact same varieties but no fungicide. The “middle” replication between the two studies is a border of Ruby Lee that is 1/2 treated 1/2 non treated. Photo courtesy Brian Arnall. In southwestern OK (near Altus, OK), stripe rust was severe (90% or so) on the flag leaves of susceptible varieties such as ‘Ruby Lee’, ‘Everest’, and ‘Garrison’. Varieties with resistance to stripe rust such as ‘Gallagher’ and ‘Billings’ showed little sporulation but loss of some green tissue due to the hypersensitive reaction (HR). ‘Greer’ showed no stripe rust and no dead tissue due to the HR. Here again, a variety like Jackpot showed no stripe rust, but leaf rust was at a moderate level. An interesting observation was made by Dillon Butchee (Helena Chemical Rep), who noticed stripe rust sporulating inside the glumes of susceptible varieties, which I have seen only occasionally in Oklahoma. In more northern OK, Greg Highfill (Extension Educator, Woods Cnty – near Alva, OK) indicated he has seen small amounts of stripe rust in the border of the test plot near Alva. Although temperature is increasing, the forecast for next week is highs only in the low to mid 80s with Tuesday-Thursday being rainy again. These temps will be lower in northern and northwestern OK. Hopefully the rain will continue, but these conditions will favor continued spread and increase of particularly leaf rust. For most of Oklahoma, I believe wheat is past or quickly approaching the point where a fungicide can no longer be applied. For a discussion of this, see “CR-7668 Foliar Fungicides and Wheat Production in Oklahoma – April, 2015,” which is available at www.wheat.okstate.edu. Nebraska: Dr. Stephen Wegulo (Extension Plant Pathologist); Univ of Nebraska, 28-Apr-2015: “Yesterday I surveyed wheat fields in south central and southeast Nebraska. Stripe rust was widespread (prevalence of >70%) in the southernmost tier of counties. Incidence ranged from about 15% to > 80% in some fields. Severity was mostly trace to low (< 10%), although a few isolated leaves had >50% severity (see attachment). Growth stage was mostly Feekes 6; in a few fields it was Feekes 6 to 8, and in two irrigated fields wheat was in the boot stage. These two irrigated fields apparently had been sprayed and there was no stripe rust in them, but I was able to find some leaves on which stripe rust development was stopped by the fungicide spray. There was severe winter kill in some fields to the extent that the wheat was sprayed with herbicide and another crop will be planted. 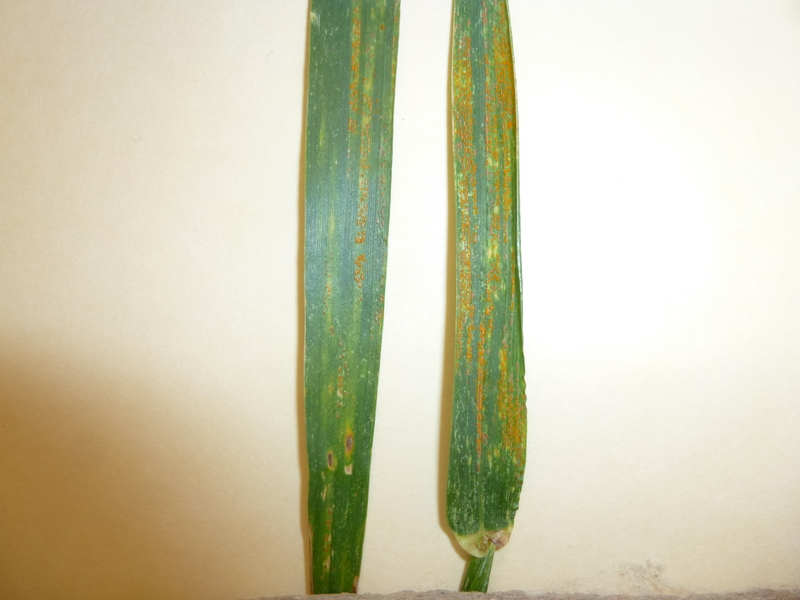 By osuwheat in Bob Hunger, disease on May 1, 2015 .